A Photo Assignment – third time’s a charm? I have spent a large part of this long weekend practicing photography. Yes, I finally got my head out of the books, took advantage of the unseasonably warm weather (Sunday = 55 degrees; Monday = 67 degrees! ), and went for a photo shoot. The assignment was to really spend time on one subject and photograph that subject from a varieties of different angles, perspective, etc. The first time I read the lesson, I interpreted “subject” in a broad sense. I decided that I would go to the local arboretum and photograph nature. While there was little floral vegetation, there were some variety of plant life and tranquil spots by the water. I took 242 pictures, of which I am willing to share three. Not great odds, but I did learn quite a bit about light and how the angle of the sun in relation to the subject can dramatically alter the mood of the picture. I learned to use my exposure compensation to help overcome my ineptitude of proper manual settings. This is actually one of the first photos I took. 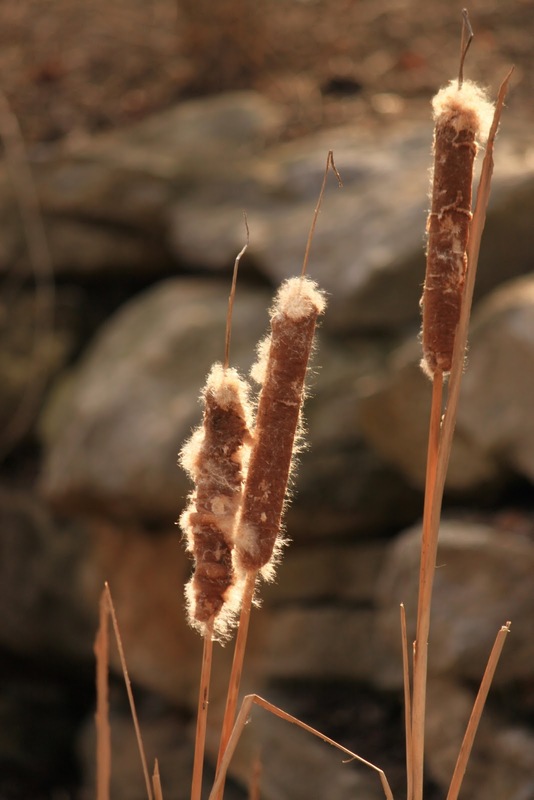 I liked the way the sun provided the warm glow to these cat’s tails. I had hoped to have the rocks a bit less in focus, so that the cat’s tails would truly stand out, but my camera lens did not stop down far enough. I experimented for quite some time with this subject, and in a couple of pictures I focused on just one of the stalks, but I thought this group of three made for a more cohesive shot. This picture allowed me to play with depth of field a bit more. As I study it, however, I wish there was more of a contrast between the subject and the background. Oh well, I am definitely still learning. After spending quite some time trying to take a picture of the rope bridge (to no avail) I looked behind me and noticed these benches next to the water. I thought it might be fun to take a picture of this spot in the middle of winter – and then return in six months and see how the tree has filled out and the grass has greened up. While I don’t think this is a spectacular photo (and I am sure many of you with far better composition techniques could give me a few pointers), I do like the idea that it could inspire a story. Who might walk into this setting and sit down by the water? A romantic couple? A lonely teen? A young mother with her newborn? After this shoot I came home and read some of the message boards for the class. Apparently same subject meant, literally, the same subject. If I wanted to photograph flowers, then the same flower from a variety of perspectives, angles, etc. Of course, this makes more sense: if I am truly going to develop my eye for the beauty around me, I need to slow down and really see the beauty up close, far away, underneath, overhead, etc. Ok — so round two. We were encouraged to find a subject that evokes an emotional response from us – something that we find inspirational. Well, for me, that would be my dogs. So I went out to the backyard for about thirty minutes and took another 211 pictures (isn’t it wonderful that we don’t have to pay for the developing of film in this day and age?!). I tried to focus my attention on the newest member of the canine family, but it was impossible not to include the other three in this photo shoot. There was lots of sniffing……running….rough-housing. In hindsight, this was not a great subject choice. Yes, they inspire me and bring me great joy. Yes, they are my most photographed subject by a margin of about 3:1 — but to try for a variety of angles and perspectives is impossible. If I tried to sit on the ground, they were on top of me. If I tried to crouch in their face, they would attempt to lick the lens. It was definitely a humorous shoot, but not terribly productive for this assignment. I did however find a couple of photos that are worth sharing….and again, I did learn a valuable lesson even if it wasn’t the focus of this particular assignment. I learned that when photographing nature, I like to use Aperture Priority, as I prefer the control over depth of field. 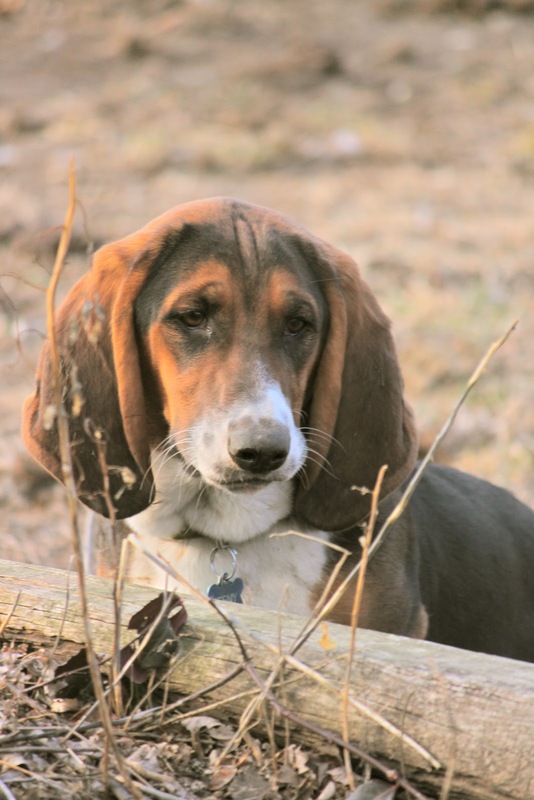 But when shooting dogs, particularly six month old puppies, Shutter Priority is the way to go. I set the shutter speed at 1/250 and the ISO to 200 (it was partially shaded), and I let the camera adjust the aperture accordingly. So, I am wondering if perhaps I should try this assignment one more time. I am thinking of perhaps trying to photograph my nook – filled with shelves of books (my next favorite pastime to my dogs). Or perhaps I could photograph my car (now that would provide all kinds of angles for different perspectives) – or maybe my morning cup of coffee? I don’t know….apparently developing my creative eye is going to take a bit longer than most. Molly, I SO ENJOYED reading your adventures! I'm laughing hysterically about the dog photography, because I know how that goes. Your cat tails are beautiful, especially how the warm light makes them glow. The bench photo is inviting, like you say, who will come and sit? It truly is fun to read about your photography! Thank you so much for sharing. Keep pressing on! Nothing wrong with different photo excursions on the same topic. If you have the time-go for it! When we took Dakota to the dog park to get photographs for my blog she was not exactly easy to work with. The shot of her and me I use for my gravatar took several tries. One I use for my banner of her with the view of the Golden Gate Bridge in the background is actually a mistake. I never did get her to hold still for the shot I wanted and had to just go with the best one. But, to be honest, the "mistakes" have often been some of the most interesting shots. I also like the benches by the water. It makes me think about who will walk by and sit there. As for photographing dogs, I know the challenge. But the last photo of the profile is very sweet. You've captured such a noble expression and the background is nicely out of focus. Aren't we all learning so much on this journey? My favourite photo is of the two benches by the water, which looks frozen. This scene would be really interesting to move around and capture many different angles… the different shapes on the benches themselves and the way the light falls on them from different angles. I love the wrought iron work and the fact that they are not the same colour. A lovely subject to study and I like the capture you have made here. I like the first shot of the 3 (are they bullrushes?) plants just caught in the sun. 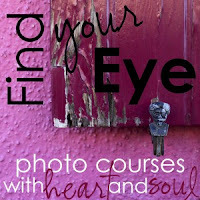 You have had fun photographing different subjects that are close to your heart! Loved them all, but your second photo stands out to me. I love the depth of field, and I especially like the contrasting textures you have going on there. The bokeh is just soft enough to let the branch really shine through. I usually shoot on AV but it makes for tough indoor pictures of Elle as she moves all the time. I actually purchased an external flash to help with the pictures and have been very pleased–not washed out like normal flash pictures turn out. I love the first picture and am glad you decided to feature three willows rather than just the one. And LOVE the idea of the scene through the seasons. I struggle with my own photographer's eye–just something that doesn't come naturally to me–but I'm enjoying learning through your journey! I can only imagine it not being easy to photograph a dog. But you have managed it beautifully. The 2nd shot is lovely. 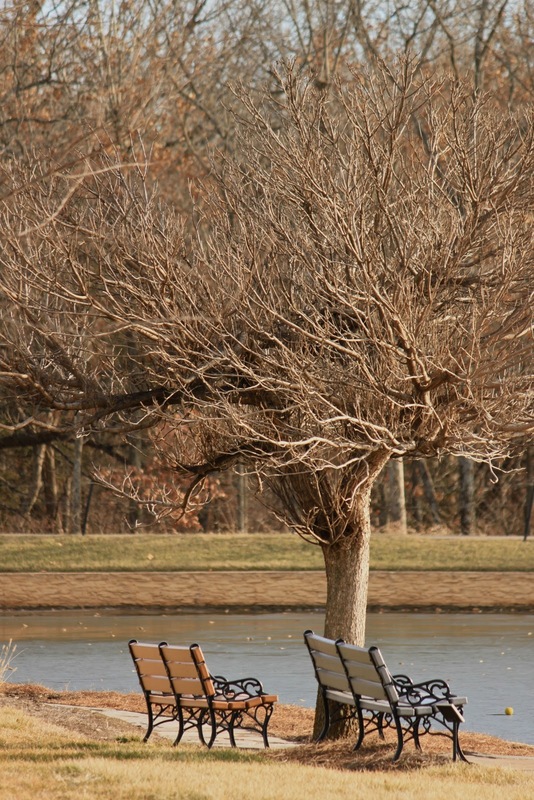 I also love the shot of the seats by the water – what a lovely place to sit and relax. What a wonderful post! You did a fantastic job on this exercise, in all interpretations of it. Learning something, whatever lessons you got from it, was the point and you took the lessons home in spades. Not only that, you captured some wonderful images! Your last two dog photos are beautiful. Moving subjects are hard – great lesson on shutter priority vs. aperture priority. I can't wait to see what you try next! I think that even if you didn't get the assignment right, it was a lucky accident as I think you learned a lot and got some good results. Dogs are very hard subjects to photograph … they just don't listen!! HAHA! I love the idea of photographing your tree at different times — it could be a great collage showing the four seasons. I can already imagine it in my head!!! Now I may have to go out and shoot a similar photo for myself! This looks like so much fun; it makes me want to get into photography in a bigger way. I like to use filters on Adobe Photoshop 8 to create different moods. And, of course, colors in scrapbooking. Have fun with it! I'd love to watch your talent evolve over the next year on this blog. I like your first photos, I took some similar ones in a field, I thought grasses, etc. were a really great subject and I plan to photograph them again as they can be spectacular in the sunlight. I have dogs too, and they are difficult to capture a nice photo as they move around so much and lick lenses 🙂 I like your last shot, a perfect portrait of your dog! p.s. I love your blog, wish I was a proficient at it as you seem to be! Your story is great. The dog photos came out well even though it was quite a challenge. I love your bench photo and think the composition is lovely. You are really inspiring me to "get out there", Molly. While I like all of the photos, I especially like the second picture. It has so much movement to it and the focus is so studied on the grass. Enjoy the process. You definitely have some winners here. I think having an assignment might stop my creativity. Sometimes when I take my camera to an event or a park with the specific idea of taking photos, I'm totally uninspired–too much pressure to get a great shot? I'm not sure. But when I'm just walking around and using my eyes, I often find good photo ops. hi Molly, what a fantastic post, i enjoyed reading through all of it & you have some great images from both sessions. i love what you wrote about the bench & the stories it has to tell & what a great idea to revisit in 6 months & see how the image will change, the back light in the first is beautiful & i just love the 3rd image of your dogs, my favorite! Your posts are a pleasure to read, as you write so naturally. Like others I especially like the benches and the idea of revisiting that shot through the seasons, while the benches just sit there waiting. I like your dogs as subjects too – hard as they may be. Maybe if you catch them when they've spent most of their energy in play, and if you simply take enough photos, which you seem perfectly willing to do. Your photographs are beautiful! Oh, you and your brother are cut from such similar cloth:) Perhaps some day you'll both realize how amazing you are!